What is your favourite finger food? On Easter, I invited a couple of old friends who came to visit Montreal for the holidays. Since I haven't seen them in years, the best approach is to spend as less time in the kitchen as possible and spend more time catching up. Serving finger foods is the appropriate theme for this evening get-together. Finger foods are anything that can be eaten without the need of utensils, quick and simple to serve. It can be meatballs, puff pastry rolls, mini-sandwiches or even freshly cut vegetables. Recently, I received some helpful pointers from my catering and foodie friend on making the most satisfying and crowd pleasing stuffed mushrooms. Mushrooms contain over 90% of water and the rest is dry matter. It is not always pleasant to bite on watery mushrooms which would dilute the flavour of your stuffing. To extract the most flavours out of your stuffed mushrooms, it is best to expel as much water out of the mushrooms, not at a point to completely dry out, but still retains some moisture. 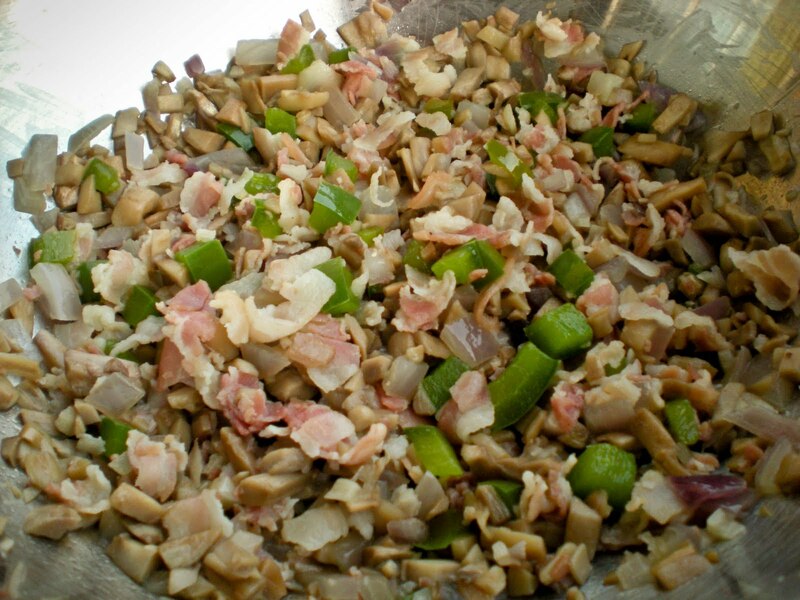 The trick is to bake the raw mushrooms without filling for a couple of minutes. Let it cool and some of the liquid will spill out. Stuffed the mushrooms and do a second bake until fully cooked, this is how you make the perfect savory finger food. These stuffed mushrooms are soft and tender, a little salty from the pancetta, a little sweet from the bell peppers and red onion, a little gooey from the cheddar and a little creamy from the goat cheese. So how many would you eat? 1. Clean mushrooms and pat dry with paper towel. Carefully remove stems from mushrooms. Finely chopped stems and set aside. 3. Line a parchment paper on a baking pan, and place mushroom caps, hollow side down. Brush caps with olive oil. 4. Bake for 10 mins until slightly softened. Let it cool. Some liquid will spill out from the caps once cooled. 5. In a skillet, cook pancetta to over medium heat until it starts to crisp. 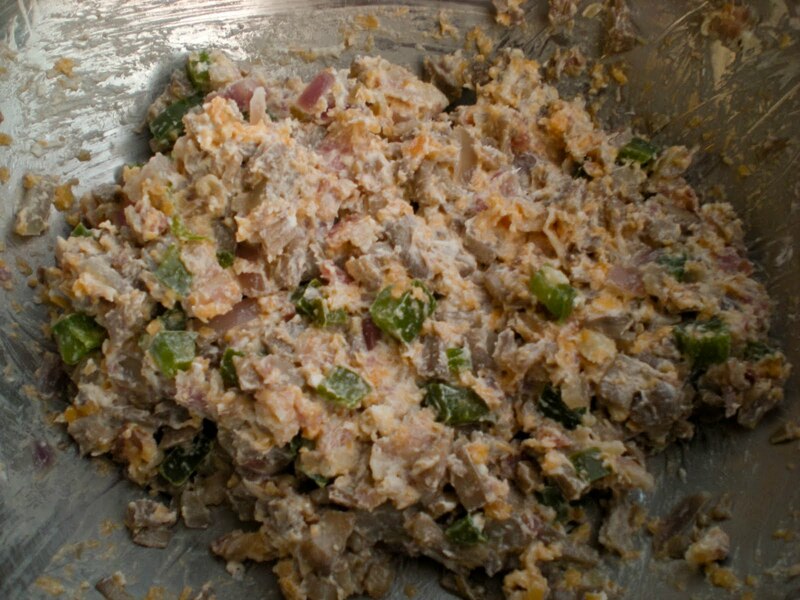 Add in bell pepper, red onion, garlic and chopped stems. Cook until softened, about 5 mins. Cool. 6. In a medium bowl, mix pancetta mixture with goat cheese and cheddar. 7. Line an aluminium foil on a baking pan, and then transfer cooled mushroom caps, hollow side up. Spoon a tablespoonful of the filling into each mushroom cap. 8. Turn oven down to 375F. Bake for 10 mins until mushrooms are softened and golden. Sprinkle with parsley. Ohmigoodness! Delicious finger food :) Perfect for evenings when you want to be where the action is and out of the kitchen. Thanks for sharing! this sounds really delicious and doesnt seem to difficult to make. thanks again for the tips given here on the mushrooms! i dont have any favourite finger food, i'll just grab everything that's being served as long as they are not too oily! My favourite finger food? Can't choose! Omg, those stuffed baby mushrooms tempts me a lot..
Been a while since I made stuffed mushrooms and your are very tempting. i usually sit them in the microwave for 2 minutes before stuffing and lots of the liquid comes out. How many would I eat? Just serve me with a plateful of this and make sure there are more around! I love mushroom and these look really delicious! Thanks for the recipe! 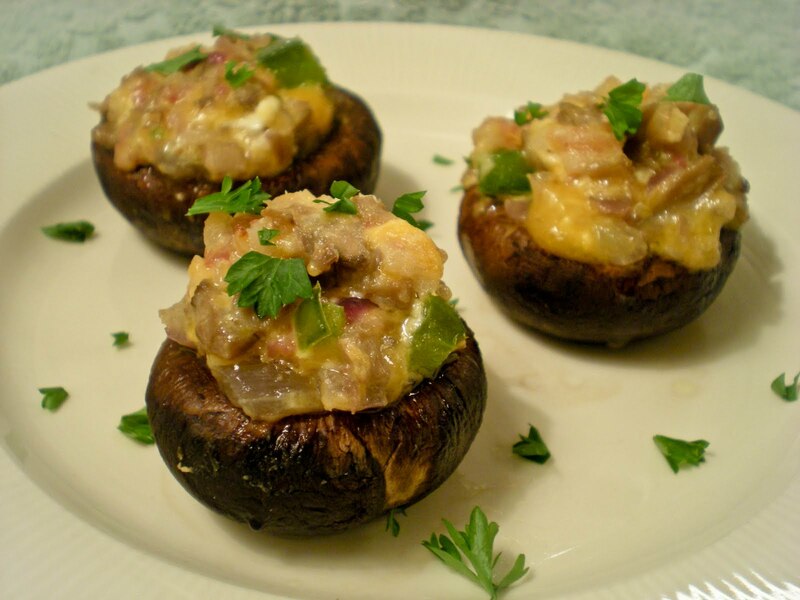 Those goatcheese stuffed mushrooms look fabulous! Bet they taste as great as they look! 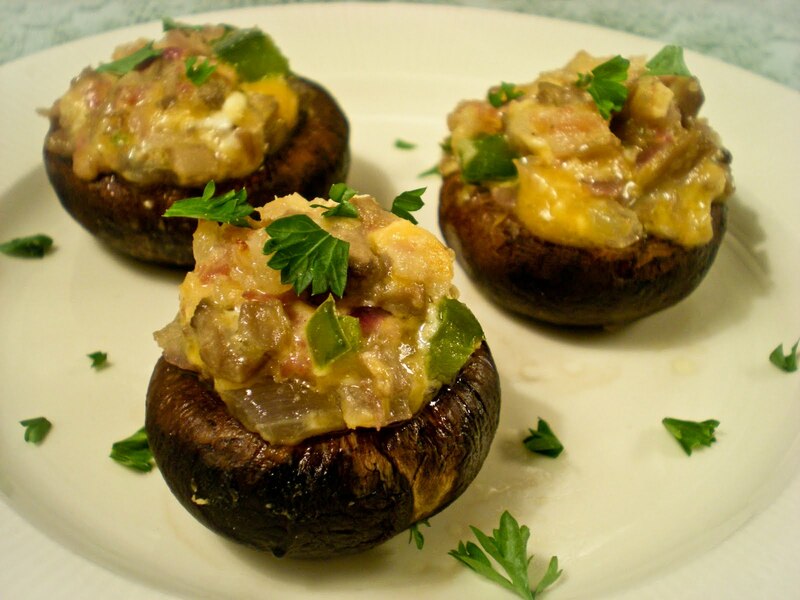 Stuffed mushrooms are a favorite of mine... your combination of flavors is wonderful! Please, Victor, make these for me!! I love them (rarely make them) and this recipe is making my mouth water. this is just gorgeous, i love stuffed mushrooms! these would disappear very quickly at my house! 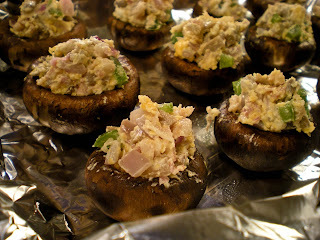 I adore stuffed mushrooms and goat cheese is my weakness! This is a delicious recipe! They sound wonderful with the Pancetta and cheese! This is right up there ranking next to twice baked potatoes in my "favorites" list. Yeah, this looks great. THis sounds nice and doesn't seem that difficult. cool! Please take a look at my cooking when you get the chance. Stuffed mushrooms is actually one of my very favorite finger foods, yours look fabulous! Other favorites? It may sound too simple, but I'm a sucker for veggie trays with dip! These looks mouthwatering and u done so beautifully:). First time in your delicious blog and in my first meeting you take my heart away with this awesome stuffed mushroom recipe! Stuffing mushrooms is really an adventure for me. This one is certainly a keeper! This is brilliant idea for finger food, quick and easy! hope your friends enjoyed all ur food, it really wonderful to know another cooking physicist! i consider cooking as one of the best therapy after the day full of work...isn't it? you seem to have been blogging for a long time shall slowly sneak in! @Ananda Rajashekar That's totally true. In a science view, cooking is great to unite coworkers and gain some insights to advance in research. That's how I got most of my collaborators. Hi Victor! I don't know how I missed this post, but this is a nice finger appetizer! Even though it looks light, I think cheese and pancetta makes it very satisfying. Great original recipe! Ok, I could seriously eat over a dozen of those! I mean mushrooms...goat cheese... pancetta..what else can a person ask for?? This makes a wonderful finger food. I agree with Jenn, cannot ask for anything better.